Adam refuses to divulge Vicki’s location to Barnabas, who is equally worried about Tom Jennings and the threat of multiple vampires in Collinsport. Jeff Clark then berates him for his inability to help, forcing Barnabas to follow a hunch and go to Stokes. The professor, under a deadline from Howard Hughes and Hugh Hefner, is none to pleased to have his business of correcting ancient Tibetan love making manuals interrupted, but receives Barnabas, anyway. Stokes is shocked at the kidnapping and agrees to help find Vicki, but refuses to reveal Adam’s location. Then Adam tells Stokes that he might just kill to teach ‘em all a lesson. So, there. Professor Eliot Stokes gains fascinating dimension in 557. Normally, jovial and helpful, we see his protectiveness of Adam reveal an irascible and sternly just man within. Anton LaVey extolled “responsibility to the responsible,” and there are few other places where Barnabas gets both barrels of that. Stokes is perhaps the most inherently good man in Collinsport since his fellow freemason, Bill Malloy, took his last diving lesson. (Ironically, at the hands of Thayer David’s first character.) 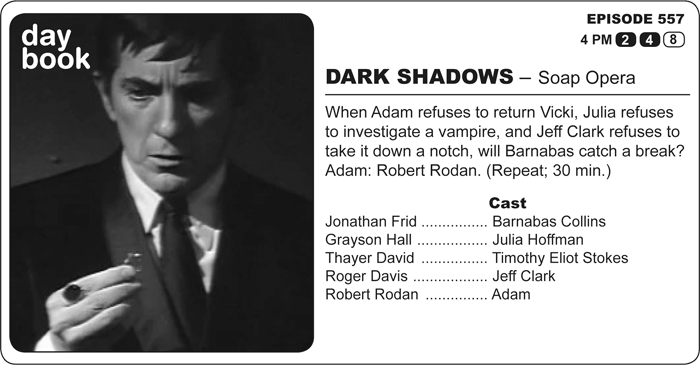 Stokes’ prime reason for siding with Adam and not Barnabas? The former vampire and Julia have withheld vital information for months. Yes, they have necessary trust issues, but this is Stokes we’re talking about. Adam may be a wildly unpredictable man-beast, capable of leveling Collinsport to sand before breakfast, but he’s also (until later in the episode) a prime graduate of Rousseau’s Finishing School for Noble Savages. He’s nursed greedily on the milk of morality that spurts abundantly from the ripe and straining teat of of Eliot Stokes’ moral tutelage. It takes a Nicholas Blair -- so often Stokes’ foil -- to teach him the less savory lessons in humanity. Stokes knows that there’s only so much danger in which Adam can find himself… Victoria Winters is another matter. It’s one of the loudest episodes since episode 46, in which men with beards (of one kind or another) spend most of it shouting in Roger’s office. It may also be the shoutin’est until Keith Prentice joins the cast and acts as if he thinks the mic is broken, and thus he must raise his voice so that even viewers in Fresno can hear every word. It’s a tough day for Barnabas. He’s a man used to operational fiction and only wants some peace and quiet. Adam yells at him. Julia yells at him. Just when he’s ready to leave, Jeff Clark is hanging out at the door, waiting to yell at him. 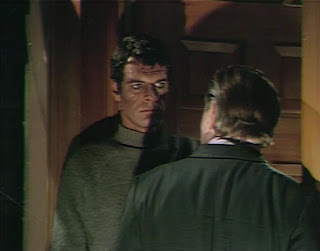 Then, Stokes yells at him. (Then, Adam yells at Stokes.) Geez, ma, stop givin’ me the business! No wonder he wants to visit Tom Jennings in the hospital. All Tom would do is hiss. 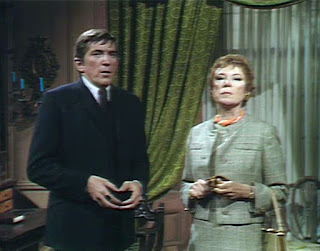 And no wonder poor Jonathan Frid has unusually pointed trouble with his lines. He’s really lost at sea in 557, but as I always say, I’d forget my lines, too, under such circumstances. For me, those moments don’t rob the show of its realism, they heighten them. It’s especially bad for him because the only token he has of Vicki’s safety is that cheap ring Jeff probably got on sale from Wal-Mart (founded about five years before, thank you). Yes, 557 is loud, how can anyone contemplating the solitude of existence be heard without making some noise? This episode hit the airwaves Aug. 13, 1968.